Yo-Kai Watch Looks Ready To Storm The World! Prepare Yourselves, It’s 1998 all over again as Yo-Kai Watch Launches this November 06 for the Nintendo 3DS. The ridiculously popular title by Level-5 who took Japan by surprise two years ago and became a cultural phenomenon is finally making its leap across the Pacific. It’s eerily similar to what once happened in Japan 19 years ago with the Pokémon series, but the similarities don’t end there. 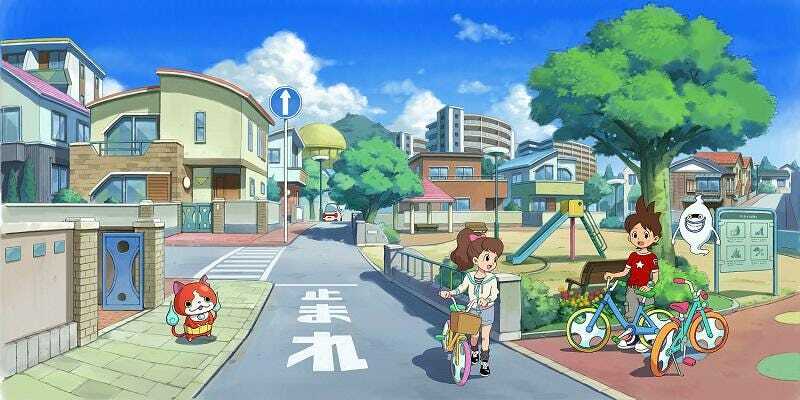 In Yo-Kai Watch you take the role of a kid who has to find, befriend and battle Yo-Kai. Just like Pokémon created a new noun for the creatures that inhabit its universe, “Yo-kai are not ghosts, monsters or creatures. Yo-kai are, quite simply, Yo-kai” The difference between the two is that Yo-Kai cannot be seen by the human eye, instead the only way to perceive them is through a device called the Yo-Kai Watch. With the power of the Yo-kai watch, find and befriend more than 200 hidden Yo-kai, found everywhere in the world, and call upon their powers when you need their help. Assemble a team of six Yo-kai in your watch to defeat evil and help people. Each Yo-kai has its own unique skills and strengths, so use strategy to assemble your team to address different problems and fight different evil Yo-kai. Make your Yo-kai Watch more powerful and upgrade your Yo-kai as you play through the story. But wait there’s more, Nintendo has partnered up with Disney XD to distribute the Yo-Kai anime adaptation, Viz Media for the Manga, and Hasbro for a line of toys; all set to launch along the 3DS title. It’s Pokémon all over again.